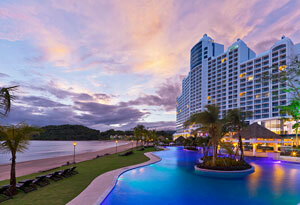 Westin Playa Bonita is a beachfront family-friendly, high-rise that sits on the beautiful beaches of Panama. Where natural serenity meets industrial glamour, the Westin Playa Bonita is strategically located alongside the Pacific Ocean, on a stretch of golden sand and surrounded by lush, tropical rainforests. With a variety of activities just steps from the resort and an array of amenities on-site, this hotel is focused on relaxation and fun. 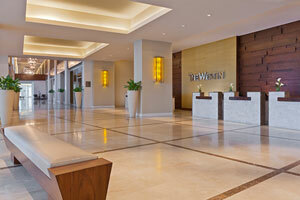 The first Westin to open in this burgeoning destination, The 661-room Westin Playa Bonita Panama, opened in 2012. All rooms are ample and elegantly decorated. Pure relaxation by restful signature Heavenly Bed® and rejuvenating Heavenly Bath®. Meanwhile, enjoy stunning ocean and tropical forest views from the balconies that ensure an exhilarating start for every day. Come and discover the wonders of Panama. As many will notice the tides in Panama change every 6 hours and there is a difference of approximately 10 feet between the lowest and highest tide. Or, get lost in the country’s rich heritage at the historical Casco Antiguo, a UNESCO World Heritage Site, or visit the scenic Amador Causeway, modern shopping centers, and casinos in Panama City. Nearby you can explore one of the region’s natural riches, Punta Bruja Nature Reserve; or fish off the islands of Las Perlas, watch whales in the Pacific Ocean, go bird watching, and be enchanted by all the other fauna and flora that this tropical paradise offers. 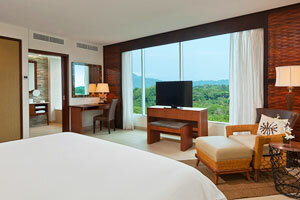 The personification of the destination: Where natural serenity meets industrial glamour - Westin Playa Bonita Panamá is strategically located alongside the Pacific Ocean, on a mile long stretch of golden sand on Playa Bonita Beach, surrounded by lush tropical rainforests, and a quick 20-minute drive from the metropolitan capital of Panamá City.